Moscow (AFP) – A Russian Black Sea city declared a state of emergency Thursday after a burst pipeline spewed oil into the landlocked water body, with stormy weather hampering cleanup efforts. The pipeline near the city of Tuapse burst late Tuesday, according to ChernomorTransneft, a subsidiary of Russia’s main oil transport company Transneft. “The wall of the pipeline broke due to… a landslide,” the company said in a statement, adding that the rupture caused 8.4 cubic metres to leak out into the Tuapse river, which empties into the Black Sea. Environmentalists warned however that the volume of the spill could be nearly 100 times greater than claimed by Transneft. The oil transport company said the damaged section of the pipeline — about nine kilometres (five miles) from the Black Sea coast — was under construction by a subsidiary of oil giant Rosneft and was not yet in use by Transneft. Rosneft also operates a major oil refinery in Tuapse. 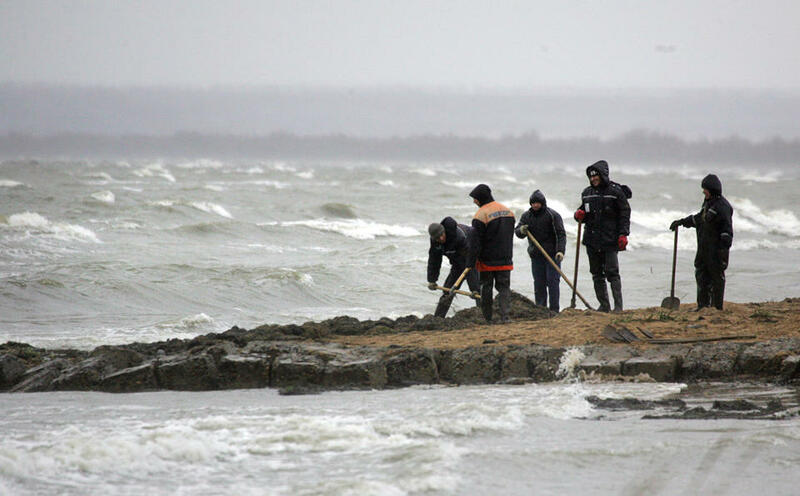 Russia’s sea and river transport agency said a cleanup mission was launched on Wednesday afternoon, though stormy weather precluded the use of boats. By Thursday, the local authorities declared a state of emergency in Tuapse and more than 300 workers were at the scene, according to the Krasnodar regional government website. “There is a state of emergency for Tuapse city,” a statement on the Krasnodar regional government website said. “Work is complicated by a storm, with waves two to three metres (up to 10 feet) high,” it said. World Wildlife Fund said Thursday that the spill already polluted 15 kilometres of the Black Sea shore, and accused Rosneft and Transneft of failing to act quickly and understating the real extent of the damage. “According to WWF’s information regarding the surface area and characteristics of the spill, the volume of the spill could be 500 to 700 tonnes (nearly 800 cubic metres),” WWF said Thursday. The organisation said the consequences could have been avoided if the energy company alerted local authorities about the accident immediately instead of delaying its response for many hours. Tuapse borders the resort city of Sochi, where Russia hosted the Winter Olympic Games in February. 57,000-Gallon Oil Spill In Canada Forces Closure Of Pipeline To U.S.
Canadian energy delivery company Enbridge Inc. has temporarily shut down and isolated one of its crude oil pipelines that connects to the United States after a 1,350-barrel, or 56,700-gallon oil spill, the company reported Wednesday evening. While the company said it’s not sure how long the cleanup will take or when the pipeline will be re-opened, it insisted that no oil was spilled out of the area within the Regina Terminal in Saskatchewan, where the incident occurred. It’s not yet clear what kind of oil was released — the 796,000 barrel-a-day Line 4 pipeline, which connects to a terminal in Wisconsin, carries heavy, medium, and light sour crude. A spokesman for Enbridge told Reuters that the spill happened because of a problem with a valve within the terminal, and not because of a problem with the actual pipeline. He called it a “relatively easy fix,” but did not give a timeline for when the system would be back in action. Bloomberg News reported Thursday that Canada’s National Energy Board would meet with Enbridge officials on Friday to discuss when the line could return to service. Enbridge itself is a large player in oil pipelines, both in Canada and the United States. It has made headlines here due to its role in the largest and most expensive inland oil spill in U.S. history, an event which saw more than 800,000-gallons of thick Canadian tar sands crude oil flow out of a ruptured Enbridge pipeline and into Michigan’s Kalamazoo River. That spill was also the costliest inland oil spill in U.S. history, with Enbridge estimating cleanup costs alone to be about $1.2 billion. That doesn’t include reimbursements to homeowners and nearby residents who were impacted. The reason why that spill was particularly disastrous was because of the type of oil involved: Canadian tar sands crude oil, which Enbridge frequently transports. When it spills, tar sands oil does not float on top of water like conventional crude. Instead, it gradually sinks to the bottom, making normal cleanup techniques and equipment of little use. Tar sands oil is too thick to transport in its original state, so it also needs chemicals like benzene to liquefy it for pipelines. That means that when tar sands spill, those chemicals evaporate into the air. Following the incident Wednesday evening, Enbridge said it was launching an investigation into the cause of the spill, and would take the results into serious consideration when attempting to prevent spills in the future. “We are committed to the goal of reaching zero spills and will thoroughly investigate the incident for lessons learned,” Enbridge’s statement said. 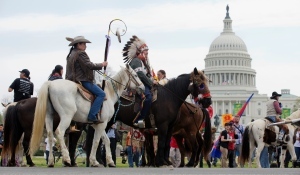 Shane Red Hawk of the Sioux Tribe from South Dakota, center, rides a horse with other Native Americans, farmers, ranchers and cowboys during the ‘Reject and Protect’ rally to protest against the Keystone XL pipeline last April. From within the Obama cabinet, there’s a new argument being made against the Keystone XL pipeline — and this one involves aboriginal rights. The secretary of the interior laid out that concern in an interview. “I think the fact that tribal nations are standing up saying, ‘We’re concerned about this. We’re concerned about water quality. We’re concerned about tribal sovereignty. We’re concerned about what this pipeline may do for our lands and our rights,’ needs to be heard,” Sally Jewell said in an interview with MSNBC. Last month, a South Dakota tribal leader warned that approving the pipeline would be an act of war. Sioux Rosebud president Cyril Scott said the pipeline would cross treaty lands and that his people weren’t consulted as a sovereign nation. A Nebraska activist who helped organize the initial campaign against the pipeline described it as a first in the years-long debate — since the conversation hasn’t dwelled much on aboriginal concerns, as opposed to the economic effects, climate concerns, and even ranchers’ rights, which have driven the discussion. The White House has previously cited a lawsuit involving ranchers as one reason it can’t yet make a decision on the route. A small fraction of landowners on the route in Nebraska are still fighting the project, and a decision is expected within weeks by the state Supreme Court. The pipeline company, meanwhile, said it was going above and beyond legal requirements to work with aboriginal communities. “Keystone XL does not cross any reservation lands or lands held in trust,” said a statement from Mark Cooper, a spokesman at TransCanada Corp. In either case, however, the final decision is still Obama’s. That’s because even a bill on the pipeline, passed by Congress, couldn’t become law without his signature. The arctic white whale, with its distinctive spherical forehead and smiling mouth, is present in and around Cacouna, Quebec where the terminal is planned. 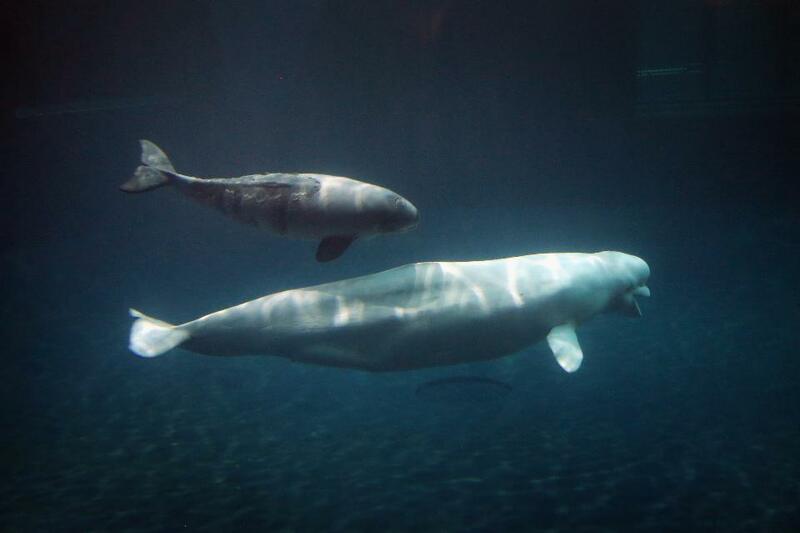 The belugas in the area were labeled “threatened” in the last formal study done ten years ago. The population was estimated to number less than 1,000 whales, compared to more than 10,000 in 2004, the Committee on the Status of Endangered Wildlife in Canada said in a report. That puts the whales at “considerably greater risk of extinction” than before, the report said, citing pollution, noise disturbance and industrial development as reasons for the northern whales’ decline. The committee is composed of scientists whose conclusions are submitted to Canada’s environment ministry. As a result of the endangered label, TransCanada halted the terminal construction in Cacouna, the company said in a statement. The Cacouna terminal was intended to be operational by 2018 as part of the $10.5 billion Energy East pipeline that’s planned to connect Canada’s east and west coasts. The decision to delay the construction was made to give the company time to analyze the beluga recommendation and review options for the future, TransCanada spokesman Tim Duboyce said. lberta Premier Jim Prentice is scheduled to meet with his Ontario and Quebec counterparts this week to lobby for support of the Energy East pipeline. Ontario Premier Kathleen Wynne and Premier Philippe Couillard of Quebec have established a list of conditions over the project. It includes having contingency plans and emergency response programs in place, making sure First Nations are consulted and that proponents consider the project’s environmental impact and greenhouse gas emissions. Prentice says he intends to meet with both premiers face-to-face to discuss the proposed $12-billion pipeline. He says it is a nation-building project and other regions of Energy East will reap the financial benefits of it as well. The pipeline would carry more than one million barrels of western crude daily from Alberta and Saskatchewan to oil refineries in Eastern Canada.